With an average of ten new online casinos hitting the already crowded market every month, it has never been harder for a new name to try and find success, and that’s the problem that faced Genesis Casino upon its arrival. Having a name behind it helps a site, and Genesis has that to an extent, coming from Genesis Global Limited, who have made waves with the likes of Casino Cruise. However, Genesis Global is not exactly one of the giants of the industry, meaning there’s still work to be done if sites on this network are going to impress. Genesis Casino is clearly one the operator has high hopes for, otherwise they are unlikely to have put their name on it, but what does this online casino have to help put Genesis Global on the map? What does Genesis Casino have in terms of substance to prove itself amongst the tall trees, the big names of the industry that dominate the busy market? Genesis Casino has a simple space theme, but the word simple should not be seen as a negative one here, as the design is executed to great effect. The banner across the top of the homepage takes you to a planet, inhabited by spacesuit clad characters from popular games available at the Genesis Casino site, which is a nice touch. While other sites on the Genesis Global network (we are looking at you, Vegas Hero) give up after the banner and put no further effort into the design, that mistake is not made here, with the starry backdrop continuing all the way down the page, presenting a pleasant background that does not distract from the thumbnails that create the design for the rest of the page. Not just there to be pretty, these thumbnails also play into the ease of navigation that is present throughout the Genesis Casino site. Any games, promotions, or information you may be looking for are simple to locate quickly. 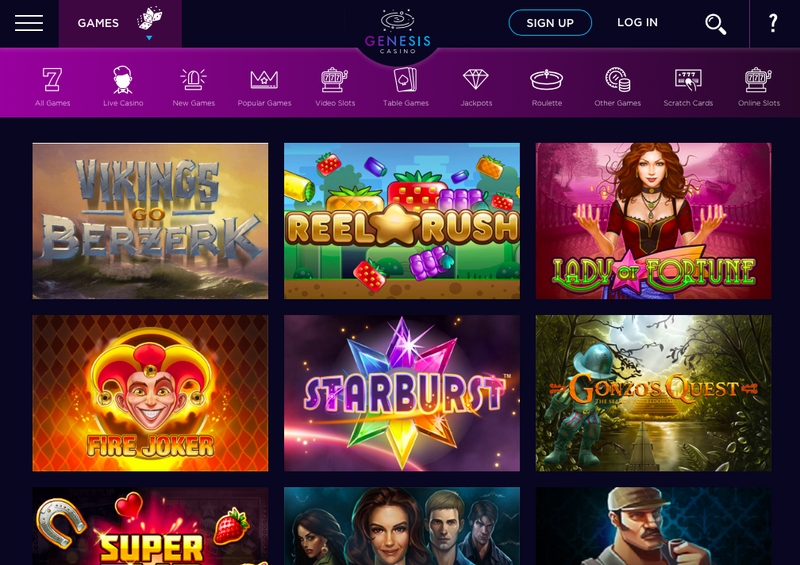 While none of this is new, or particularly impressive, it’s rare to find a site that does it all so well in terms of design, and that, more than the design itself, is what leads to Genesis Casino standing out from the pack. Genesis Global Limited is a strange creature when it comes to the games offered at their online casino sites. While the collection of games is vast, well over 1,000 are available, they do not come from as wide a list of software developers as you may expect them to. With titles coming from ELK Studios, Evolution, Microgaming, NetEnt, NextGen Gaming, Play'n GO, Quickspin, SG Digital, and Yggdrasil, there is no shortage of quality here, but the selection is somewhat lacking in range. A complete lack of games from up and coming developers, combined with some big names such as Playtech and Thunderkick, means that while there may be a strong number of games, you may not find what you’re looking for, and Genesis Casino is one of the least likely places to find a slot or table game that you may not have experienced before. 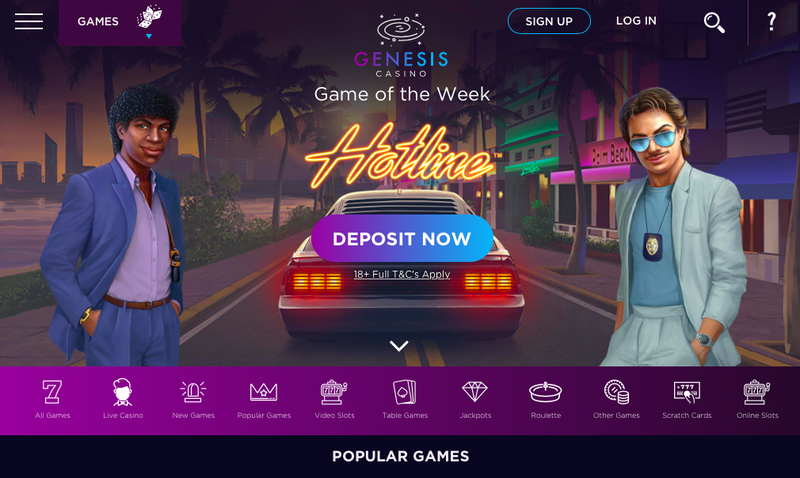 Genesis Casino looks great, and it does a lot of things right, the only thing letting this online casino down is the lack of agreements the operator has with software developers, which will hopefully change in the near future.